It’s a brave (or possibly foolhardy) soul who goes gloveless in the warmer months. We may not need gloves to stop our fingers getting frost bitten, but without a protective layer the vegetation that lines the trails is likely to make a grab for our skin. Not to mention the inevitable palm shredding desperate wall grab, or gravel glide as you shred that corner – and your skin. But get the wrong glove and your hands will sweat until your skin starts to pucker, or you overheat so much you whip them off – just in time for when you fall off. So here we go with a round up of lightweight gloves that promise to offer breathability, for when gloves are about protection from the world around you, rather than the weather. If anyone should know a thing or two about designing summer ride gloves, the Californian’s should. 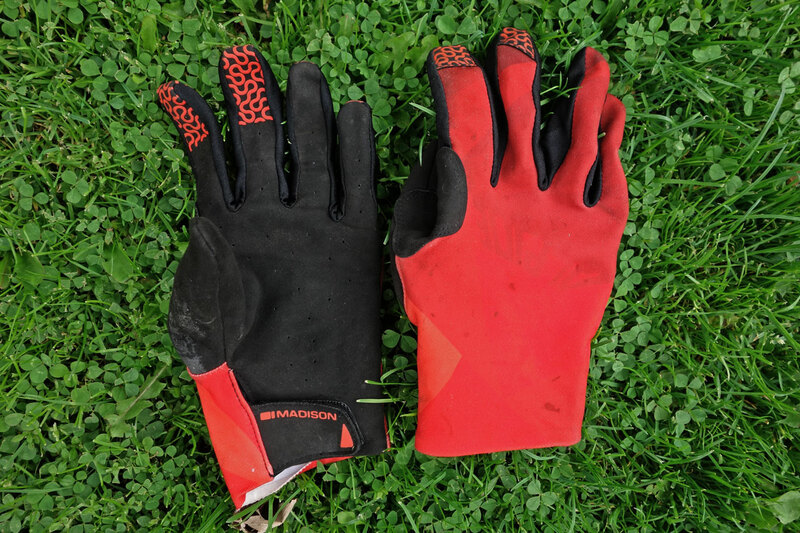 100%’s iTrack gloves kick off the ‘summer gloving’ very well, by being easily pulled on and off and benefiting from being a pliable, multi man-made material affair. The cuff itself secures the glove in place well without the need to add additional Velcro or strapping. On the palm side, the rubberised (silicon printed) 100% logo graphics improve bar grip and brake lever feel. The perforated, single-layer palm feels very natural and connected against core contact points and is adept at reducing bunching against the bar grip. The small 3mm thick foam thumb overlay does a pretty good job of protecting against blisters at this key contact point. On the Polymesh backhand, the hundreds of perforated holes stretch and open very effectively to increase airflow into the backhand. This material’s flexibility aids massively in supporting the overall, snug glove fitting. The ‘iTrack’ moniker may well be indicative of tiny stitching across the index finger and thumb which helps the user poke their tech device out on the trail, with the gloves on. Price is on the money with their natural competitors. They are a great fit, (an XL here and are true and snug to size expectations) and have lovely feel out on the trail. Plenty of colour and five size options to get the fit and look just right. Looking for maximum breathability and comfort, good grip and a little protection, with a minimalist feel and complete lack of finger restriction? Well, these are as close as this tester has come to riding with that sacred ‘no gloves on’ feel. Often with minimally padded gloves, you make a compromise to get a thinly-padded palm in exchange for less durability. Aiming to eliminate that compromise, the Attack 360 glove from Altura features a thin palm that is reinforced in key wear areas to help boost their overall longevity. 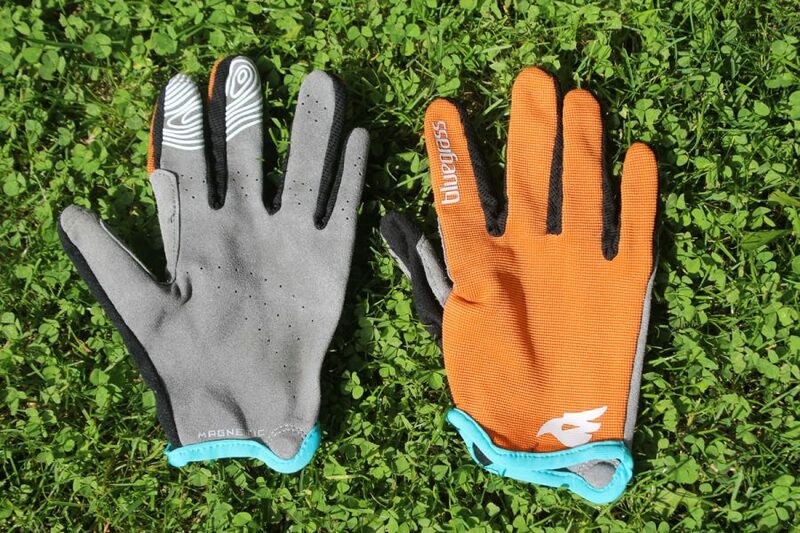 At this point in time, Altura make two different glove models for mountain biking. The Attack 180 is their superlight minimalist glove, with a thin synthetic leather palm and an elasticated cuff. The Attack 360 builds on the same platform, but features articulated knuckles, a Velcro tab for the cuffs, and a few extra panels of synthetic leather for the palm. The additions do make the Attack 360 glove a few quid more expensive, but in my experience the upgrades are well worth it in the long run. The pull tab in particular is a must-have feature for easing your fingers into the gloves, and it’s an area where many other minimalist gloves typically fail within the first few months of heavy use. Despite the reinforced palm, the Attack 360 still feels light on the grips, and it features perforations that are surprisingly effective at getting fresh air into your sweaty mitts. The articulated knuckles give a nice and flexible feel when death-gripping the bars, but my favorite feature of the Attack 360 gloves is the fact that there is no stitch line across the end of the index and middle fingers. Instead, Altura wrap the fabric over the top of your fingernails, and stitch it further up. It’s a subtle feature, and one that you usually only notice when you go back to wearing other gloves that have stitching right underneath your fingernails. Overall: The Attack 360 gloves from Altura aren’t cheap, but they are hard-wearing, while offering that minimalist feel on the bars. Top gloves for three-season riding. Ok, so that’s a lie. 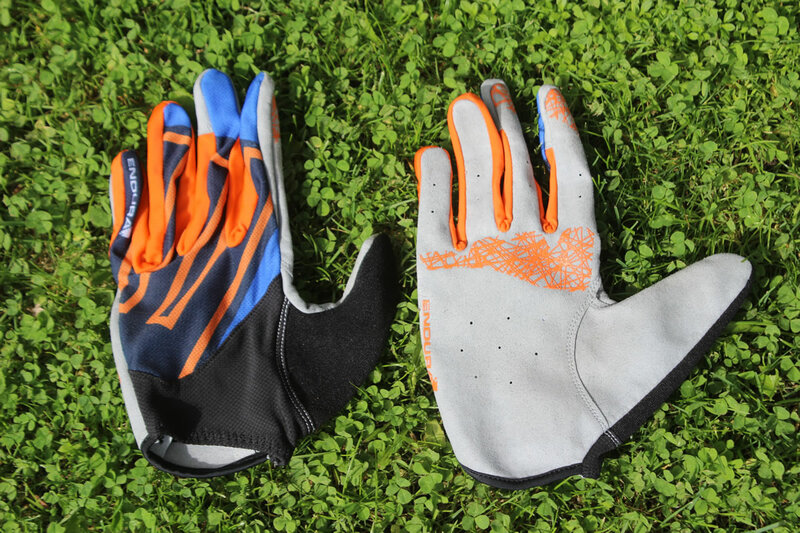 I have a few more words for you about the Magnete Lite gloves from Bluegrass Eagle. But first, lets go back to the magnets. In the cuff of each glove is a small and discreet circular magnet. I kind of thought this was a bit of a gimmick at first, but it turns out it’s incredibly useful. At the end of a ride when I’d normally faff around with keys while stuffing my right-hand glove into a pocket, I could simply stick the glove to my other hand while I calmly entered my place of residence. Mid-ride Instagramming has also been a lot more efficient (much to the appreciation of my riding peers), as you can easily swing the pair over your bars while they stay stuck together. 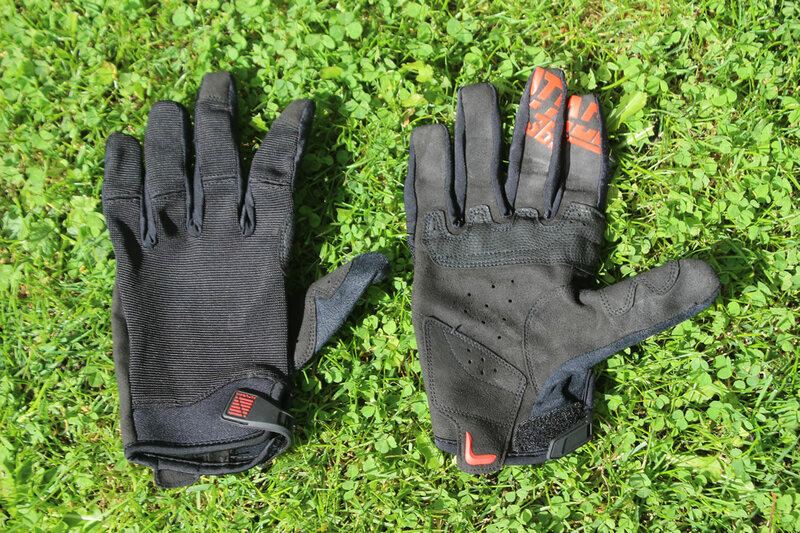 And for those riders who have a hard time keeping track of socks and gloves in their gear bag, the fact that the Magnete Lite gloves stay stuck together drastically reduces the chance of losing a glove. The gloves themselves are nice and lightweight in their construction. Bluegrass Eagle make three different models, and the Magnete Lite is the thinnest and most flexible of the lot. They use a thin, single layer palm that is about as close to having naked hands as you can get. The top fabric is a 4-way stretch number, so they fit nice and snug without feeling restrictive. Silicone detailing on the end of the index and middle fingers helps with grip on wet and slippery brake levers, and I also found the Magnete Lite gloves to be easy to use with the touch-screen on my phone. The Magnete Lite gloves are available in Small, Medium, Large and X-Large sizes, and you can get them in a range of different colours. Unfortunately the bright orange pair I had on test didn’t stay bright for long. A couple of rides and washes was all it took for them to become a more subdued auburn colour. Overall: The Bluegrass Magnete Lite is a nice and lightweight option for riders who appreciate thin gloves with maximum tactility. The magnetic buckle might seem a bit of a gimmick, but it proved surprisingly useful. The Hummvee Lite is a super simple stripped down full finger glove.Construction takes a minimalist approach with a lightweight and breathable stretchy mesh material that gently hugs the back of the hand and a thin synthetic leather palm that’s devoid of padding and reinforcements. Silicone print features on the palm, index and middle fingertips for increased grip and you get a section of terrycloth material on the back of the thumb for brow mopping/nose wiping moments. They are fairly short with the cuff of the glove stopping short of the wrist and with no velcro closure they are slip on/slip off gloves. Despite no closure or extra elastic here they stay in place snug enough. Fit and feel is good with a hardly there sensation, they’re lightweight and comfortable. Both the palm and back of the glove are fuss free with no extra sections or pieces. There’s no bunching and both air flow and resistance to abrasion/snagging from trailside growth is good. Overall: Most definitely a case of use what is needed and nothing more/ less is more design. Good value too! 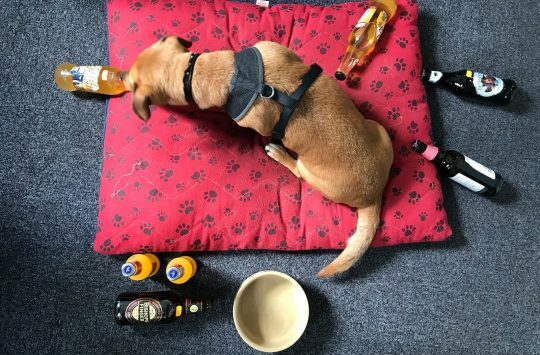 The DND (Down n’ Dirty) is a well-constructed and hard-wearing. It’s termed “simple” by Giro but actually has a fair number of features which combine for a good performance and fit. The palm is constructed from a three-piece synthetic suede which conformed well and there wasn’t any excess material or movement between my hand and grips. The material did a good job at absorbing hand sweat although lost some of its grip when it got soaked in the rain. At 2mm thick the small heel pad isn’t going to provide tonnes of protection but it does add a notable comfort to the glove and I’ve happily worn these on some marathon rides without any numb-effects. The upper glove is a thick mesh which gave good ventilation as well as excellent protection from the summer’s nettles and brambles. One of my favourite features of the DND were the reinforced tips of first two fingers which, alongside the robust mesh, means the DNDs are likely to outlive many other lightweight gloves. The silicon grips on the thumb and first two fingers were larger and grippier than most other gloves – I was surprised how much difference this made compared to what I’m used to. The DND is available in a range of colours and sizes in both men’s and women’s fit. According to the sizing chart the glove I tested was right for me but in reality came up rather small, it’s probably worth trying a couple of sizes before you commit. The Alpine range from Madison consists of a full head-to-toe selection of jerseys, shorts and long sleeve tops, gloves and these gloves. Available in three colours; a grey, a black/white and these black and red numbers, they all fit in well with the rest of the Alpine range, if you’re a rider who likes to match gloves with jersey, or socks with shorts. The build is on the light, summery end of the scale, with an unfeatured Lycra back and an unpadded palm. The Velcro closure is under the wrist so that it doesn’t interfere with your wrist movement on the grips. The thin palms are lightly perforated and it’s possible to feel the breeze if you hold your hand up when riding. The unvented back is a little warm on truly hot days, but it’s pretty thin and who has sweaty backs of hands anyway? The first two fingers are rubber tipped for grip on the brake levers and the synthetic suede palm, fingers and thumb offers great grip and feel. 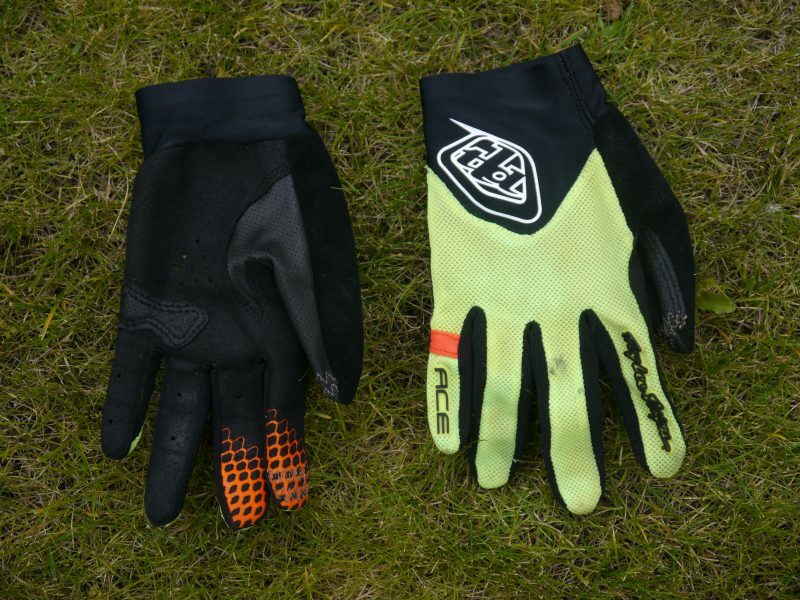 The super light feel is very welcoming for riders who might otherwise skip gloves in hot weather and it allows great grip and feel on the bars and controls while still offering good protection from sliding down a track. We did find the edge seam on the back of the glove quick to unbond, but that hasn’t affected performance or longevity. And at this price, they can be forgiven a great deal. Overall: Very affordable, light and airy gloves that offer fantastic feel. These are sold as a thin, slim fitting glove with ventilated palm. They’re made of synthetic fabrics, including the suede-like palm. Size wise, slim fitting seems about right, as I wore a medium in these and they fitted fairly snugly for a unisex glove, with the adjustable velcro wrist band doing its job – you have to undo it to get the gloves on and off. 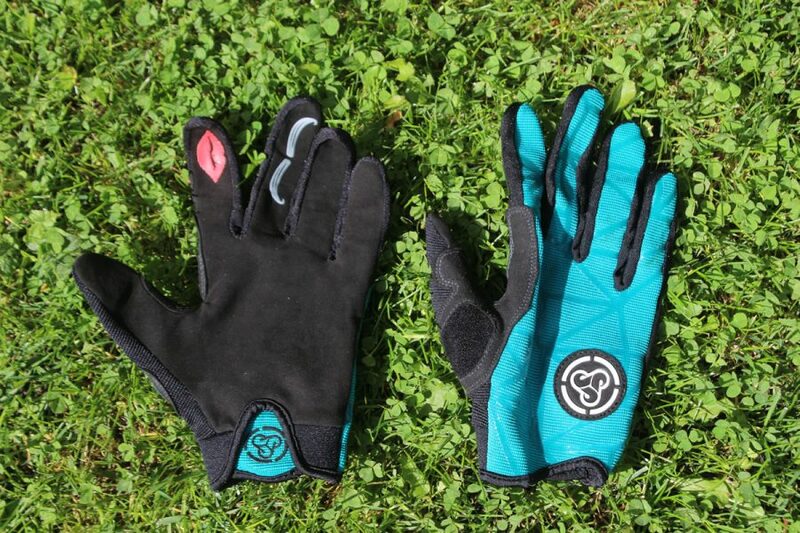 The palm and fingertips are ventilated, and the gloves have been comfortable to ride in during warm weather. That said, they’re not the coolest gloves that I’ve worn, as there’s no ventilation on the uppers, and this is the part of your hand that is exposed to the breeze as you ride along, while the ventilated palm area is somewhat protected. In really hot weather I think they’d be too warm. There are grip patches on the index and middle fingers to help keep your grip on the brake, a reasonably sized snot wipe area, and a touch screen patch on the thumb. This has all but ceased to work following the many wearings and washings during the test period. I’ve worn them loads, got them soaked many times (they’re still quite light and comfortable when wet), and washed them many times more (in the machine, contrary to the hand wash instructions). Aside from the touch screen thumb, they’re as fresh and functional as they were out of the packet. Overall: Not the very coolest gloves for hot weather, but very well made and showing all the signs of being a long lasting glove. Let’s get the obvious out of the way first, the colour mix of Navy Blue and Lime Green is a bold design statement – these gloves are LOUD. The pictures don’t do them justice – I’m not even sure that a live Rob Warner commentary would do them justice – these gloves are DEAFENING! It says here that they feature “aggressive ergonomic pre curve to avoid bunching”. I didn’t know aggressive ergonomics were a thing, but in these enduro times what self-respecting mountain biker wouldn’t want the intersection of bike and rider to be anything else? The blue technically knitted mesh on the back keeps the feel light and airy and the seamless finger tips make it possible to use a phone without de-gloving. Crucially, the back of the thumb is micro fibre, because nobody wants a technical mesh snot-wipe. There is no padding in the palm, so if that’s something you need in your life these are not the gloves you’re looking for. 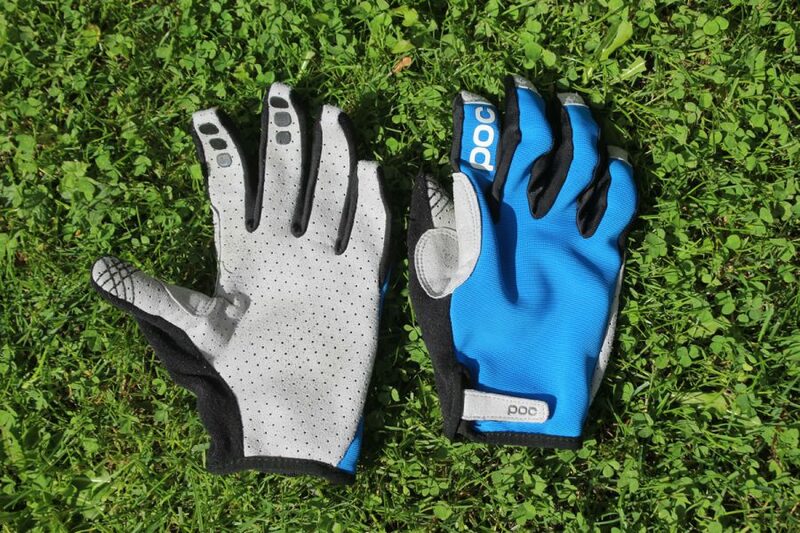 For a lightweight summer glove the Quantum offers solace for your hands in the rough and tumble world of mountain biking. 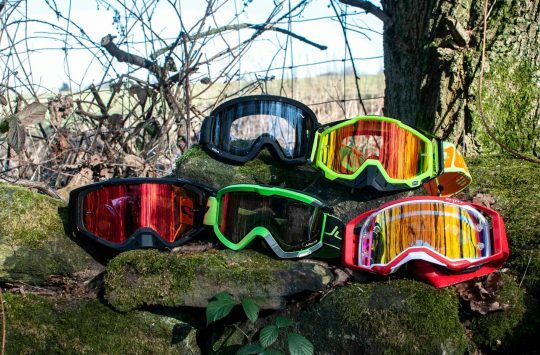 The colours won’t be to everyone’s taste, but should you crash horribly in the woods wearing Quantums it shouldn’t be hard to find you. These are cuffless pull-on women’s specific gloves. The mediums fit me very well, with no bagginess anywhere. Although the cuffless design does feel a little strange at first, once on the bike these are fine, save for the occasional bramble on the wrist bone. The ‘terry moss’ snot wipe is probably the smallest I’ve ever encountered – you could daintily dab one nostril at a time, but don’t wipe on it or you’ll catch your delicate nose end on the edge of the suede-like thumb and gusset. It’s amazing how many times you can repeat the same mistake without learning from it. First and middle fingers are adorned with a moustache and lips, which as well as adding a touch of fun to riding selfies also serve to give extra grip when braking. Mesh on the webbing between the fingers adds ventilation, although not enough for hot days. You can operate a touchscreen with the pads of your fingers, but not the tips, while wearing these gloves. 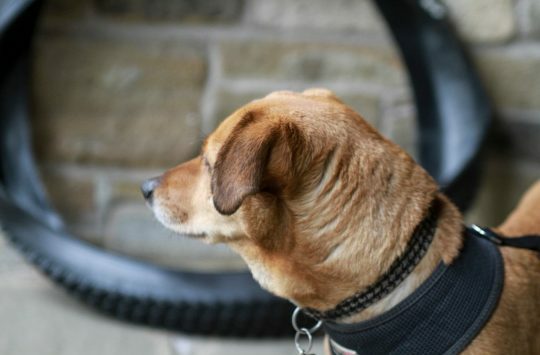 They’ve proved hard wearing and have fended off all manner of undergrowth and washing machine encounters without pulls developing – so perhaps the Kevlar thread construction is indeed doing its job. Overall: More of a spring, autumn and rubbish summer days glove, but well made and robust with fun styling and a good fit. 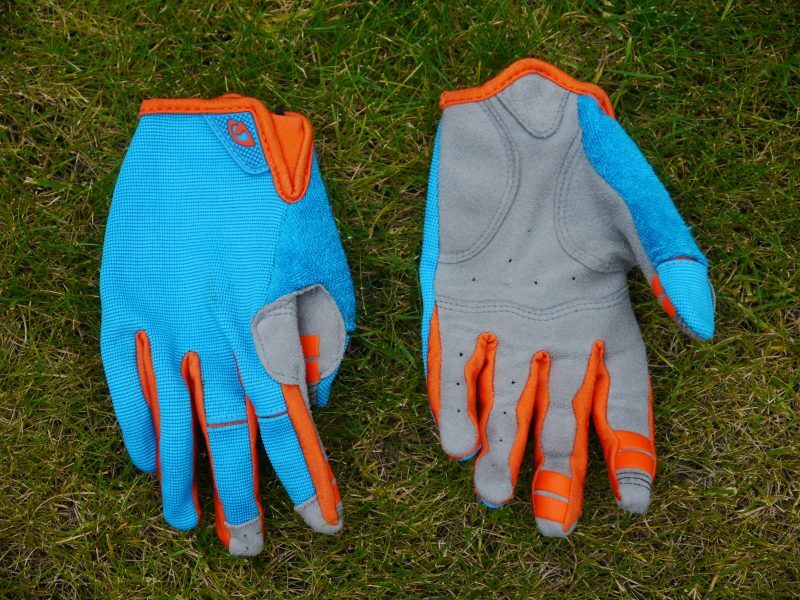 The Ace Lightweight is a very, erm, lightweight glove. The palm is a thin, faux suede material with no significant padding or reinforcement. This makes for an excellent grip and feel although doesn’t offer much comfort or protection. The upper is a very light so your hands stay nice and cool but it doesn’t give much defence from the overgrown undergrowth. The seamless elastic cuff holds the glove snuggly in place with minimum effort and the gloves are easy to get on and off. The silicon grips on the first and second finger ends performed less well, possibly because on the index finger (I’m a one-finger braker) it was heavily over-sewn with conductive stitching for touchscreen compatibility. There’s the standard nose wiper but I found it a bit better at smearing than absorbing. I also discovered that I have a habit of wiping my face with my index finger, the raised rubber graphics on the finger soon taught me to avoid doing this for fear of grating my nose. The Ace is available in a variety of colours in both men’s and women’s fit. The medium I tried came up smaller than the sizing chart so it would be worth trying a couple before you decided which was right. The Ace Lightweight is a pretty minimalistic glove and is probably as close as you can get to a bare handed feel with gloves on. So far they’ve held up reasonably well but I’m unconvinced how well they will fare given more ride time, brambles and crashes. 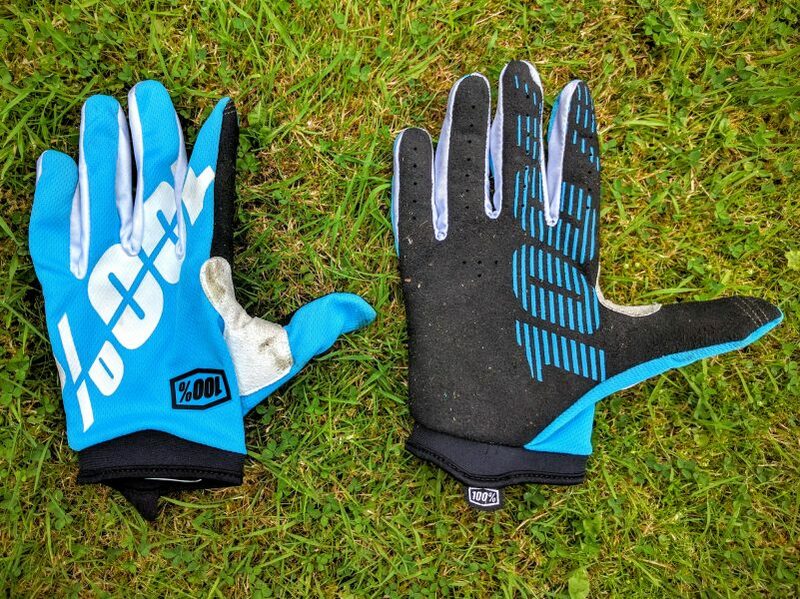 It turns out that getting a glove to fit like a glove can be harder than you might think, and since your hands are a major contact point with your bike, it’s worth getting down to your local bike shop to try on a few options. 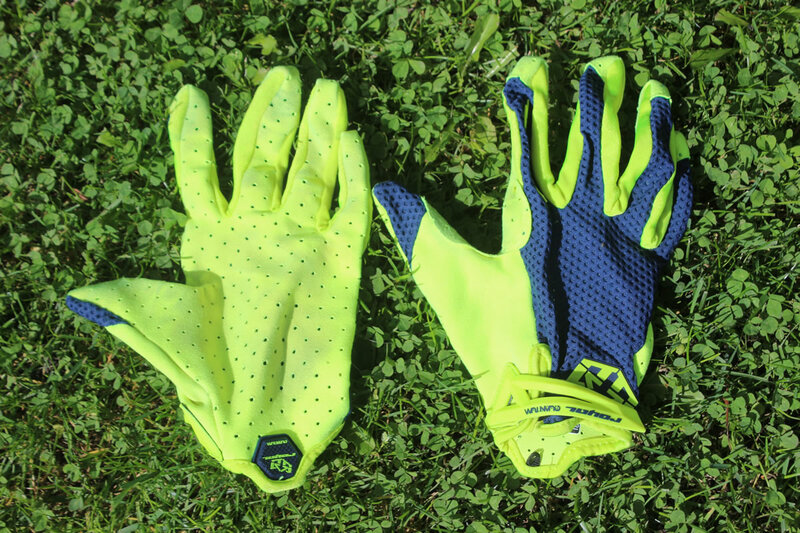 Some of our testers have found their perfect lightweight glove, others are still looking. Hannah rues the day she didn’t buy many pairs of her now discontinued favourite. How about you – do any of the gloves above take your fancy, or have you already met your perfect pair? Sod lightweight gloves, why don’t more manufacturers do ones with decent finger and knuckle protection? There were loads to choose from a few years ago, now they all seem to have gone ultra minimalist. A lot of the trails I’ve ridden lately are disappearing under brambles, nettles and bracken, and gloves the thickness of tissue paper aren’t helping the comfort situation at all. Intersting.. I’m not even going to consider any glove where the leather palm doesn’t extend around the tip of the fingers, so POC wins by default… There are always sales on so £42 can be beaten. On Madison’s Alpine gloves, the palm suede does wrap right around the finger tips on the index & middle finger so no issues with bursting the seams. Silicon gripper all round too for braking.